Examination (GRE), Graduate Management Admission Test (GMAT) or Miller Analogy Test (MAT). Refer to specific academic programs for details at http://www.jmu.edu/grad/prospective/degree_programs.shtml. NOTE: Students may not substitute experiential learning for required academic credit. An application is not considered complete until all required credentials and supporting documents have been received by The Graduate School. Prospective students must submit their applications and supplemental materials online. Applications that are not completed within 90 days of initial receipt will not be processed. In accordance with the Southern Association of Colleges and Schools guidelines, graduate programs must have both qualitative and quantitative requirements that result in the admission of students whose educational preparation indicates the potential for a high level of performance. Admission procedures include the requirement that an applicant submit, as part of the formal application process, evaluations by professionals in the field as to the readiness of an applicant for graduate work and, if appropriate, credential evaluations. Standardized test admission criteria for each graduate program are established by the faculty responsible for instruction in that program. Contact the program directly or see The Graduate School website for specific requirements. General Application Procedures Prospective students must submit their applications online through The Graduate School website. For details, refer to http://www.jmu.edu/grad/prospective. As an applicant, you will have access to JMU’s MyMadison interactive applicant center which allows you to view your application status, read JMU news and announcements, and utilize tutorials and frequently asked questions for applicants. Upon successful submission of your application, you will receive an electronic response confirming receipt of your online application, as well as instructions on activating your JMU eID as an applicant. This will allow you to access the Applicant Center on MyMadison, JMU’s student information system, so you can track the status of your application. Once your application has been reviewed by the program to which you applied, the program will submit a recommendation to The Graduate School. You will be able to view your admission decision in the Applicant Center. Students who need a paper format due to a disability should contact the Office of Disability Services to determine their eligibility for accommodations in the application process. 1 Paper applications require a $65 fee. Graduate applications will not be processed without application fees. Application fees cannot be waived, except for McNair Scholars. Payment must be made online. Official transcripts sent directly from all previously attended institutions. Official transcripts may be mailed or sent electronically through eSCRIP-SAFE® global electronic transcript delivery network. The official standardized tests scores (GRE, GMAT, etc.) sent directly from the testing center, JMU graduate institution code 5392. Application Deadlines Refer to specific academic programs for details at http://www.jmu.edu/grad/prospective/degree_programs.shtml. Have the necessary ability and educational background to benefit from experiences in this institution. Demonstrate proficiency in English sufficient to carry a full program of graduate study through submission of a satisfactory score on the Test of English as a Foreign Language (TOEFL) or on the International English Language Testing System (IELTS). JMU’s graduate institutional code is 5392. o Examples of acceptable TOEFL scores include 570 on the paper-based version, 88 on the internetbased version, and 7.0 on the International English Language Testing System (IELTS). Have all funds necessary for expenses during the entire period of the student’s stay without resorting to employment while in the United States, and complete the Financial Declaration form. The university has no financial assistance reserved exclusively for international students. International students are permitted to compete for assistantships with other graduate students. Submit a credential evaluation of the academic record to ensure that it is comparable to a U.S. baccalaureate degree. External evaluators are listed online at http://www.jmu.edu/grad/international/admissions.shtml#CES and listed under Credential Evaluation Services. Complete an International Student Adviser’s Report form if the applicant is currently in the U.S. on a student (F-1 or J-1) visa and wishes to transfer his or her visa to JMU. Enter the United States on a valid student or other visa. International students requiring English language preparation: http://www.studygroup.com/isc. The Pre-Master’s program, taught at the on-campus International Study center, offers intensive English language and academic preparation. Offer of Admission to The Graduate School Once your application has been reviewed by the program to which you applied, the program will submit a recommendation to The Graduate School. You will be able to view your admission decision in the Applicant Center of MyMadison. The Graduate School will send official written offers of admission to applicants who have been accepted. This letter specifies the effective date of admission (which normally coincides with the semester requested on the application) and the classification of admission being offered (unconditional, conditional or provisional). After being accepted into a graduate program, you can then log into the Applicant Center through MyMadison and either accept or decline the offer of admission. Students who want to defer enrollment may do so only with the written approval of the graduate director of their academic program and The Graduate School. Under no circumstances may the deferral be for more than one calendar year. Some programs specify dates by which notice of accepting or declining an offer of admission is due. These dates will be indicated in the letter of admission. Regardless, all applicants must notify The Graduate School regarding accepting or declining the admissions offer at least two weeks prior to the start date of the semester in which they have been admitted, unless another specific deadline is indicated in the letter of admission. This allows the specific program to invite other candidates. A student who enrolls at another institution is considered to have declined the university’s offer of admission. An applicant who has received an offer of admission but who has not responded by at least two weeks prior to the start date of the semester is considered to have declined the university’s offer of admission and must submit a new application and fee to be reconsidered for admission at a later date. Admissions Classifications Applicants may be admitted to The Graduate School under three classifications: unconditional, conditional or provisional admission. Unconditional Admission Unconditional admission indicates that an applicant has met all the entry criteria of The Graduate School and the specific graduate program. the previous academic record is weak. prerequisite course work is insufficient. the applicant has majored in another field and has not yet clearly demonstrated abilities in the proposed new field. The requirements for advancement to unconditional status are specified in each applicant’s provisional admission letter. It is the student’s responsibility to notify his or her adviser when the conditions of acceptance have been met. The adviser or graduate director then contacts The Graduate School indicating the change of status. The Graduate School determines if graduate credit earned while enrolled in a provisional status is acceptable based on the recommendation of the academic unit head. A student is limited to nine hours of graduate credit in this status. Regulations concerning unsatisfactory progress apply to this classification. See Unsatisfactory Progress for more information. Appeal of Admission Decision Although an applicant’s admission classification or denial of admission into a program emanates from The Graduate School, all admission decisions, including the denial of admission to a program, are made by the reviewing faculty of the program to which the student applies. As such, any appeal of an admission decision, including denial of admission, must be directed to the individual graduate program. 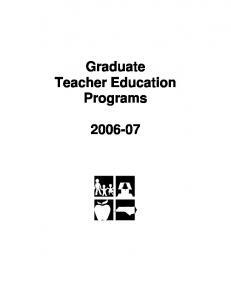 Change of Program Admission to The Graduate School and a graduate program does not entitle a student to transfer to a program in another academic unit as defined by The Graduate School. Any student wishing to change graduate programs must submit a new application for admission, application fee and any updated standardized test scores or transcripts to The Graduate School. The student is responsible for meeting all academic unit requirements for the desired program. Criminal Background Check Programs may require a criminal history check as part of the final admissions process. The applicant should consult the program to which he or she is applying for more detailed information. Applicants are responsible for any fees associated with background checks. Continuous Enrollment All students enrolled in graduate degree programs must enroll each regular semester for a minimum of one graduate credit hour. This registration must continue with no breaks from enrollment in the first graduate program course to graduation. This policy does not include summer sessions. Students should enroll in courses relevant to their graduate program to facilitate timely completion. If it is not possible to do so, however, The Graduate School has established a one-credit Continuous Enrollment course, GRAD 597. The tuition for this course is $50.00. No grade will be assigned for this course. For more information, refer to the General Regulations Web page of the catalog. Time Limitations Master’s and Educational Specialist Students Master’s and educational specialist students must complete all degree requirements within six years. Academic credit, including transfer credits taken before enrollment in the graduate program, completed more than six years before the date at which the master’s or educational specialist degree is awarded may not be used to satisfy the degree requirements. Students may submit a written petition through their adviser, graduate program director and academic unit head to The Graduate School to receive extensions of time in the event of extenuating circumstances. Such requests must be received at least one month prior to the end of the student’s original six-year time limit. A student whose status is deactivated but later is reactivated through reapplication to The Graduate School may not count the six-year time limit as beginning on the date of reactivation. Doctoral Students Doctoral students must complete all degree requirements within eight years. Academic work, including transfer credits taken before enrollment in the graduate program, that was completed more than eight years before the date at which the doctoral degree is awarded may not be used to satisfy the degree requirements. Students may submit a written petition through their adviser, graduate program director and academic unit head to The Graduate School to receive extensions of time in the event of extenuating circumstances. Such requests must be received at least one month prior to the end of the student’s original eight-year time limit. A student whose status is deactivated but later is reactivated through reapplication to The Graduate School may not count the eight-year time limit as beginning on the date of reactivation. University Residency Graduate students must register a local address with The Graduate School office prior to initial registration for classes. All changes in local address must be registered with the Office of the Registrar. This can be done through MyMadison, online at http://www.jmu.edu/registrar. Report "Admission to Graduate Programs"